Indian airline Vistara will feature South Asian nations among its first international destinations, a senior executive said on Wednesday, as it devises its strategy after the government eased restrictions on flights abroad last month. Vistara, a venture of the Tata group and Singapore Airlines Ltd, is "reviewing and refining" its plan for overseas routes and will decide on aircraft orders afterwards, Chief Strategy and Commercial Officer Sanjiv Kapoor said at an event. "The first set of routes that we will launch internationally will be the routes that can be flown by our existing aircraft, the A320s, which will be routes within three, three-and-a-half hours of India," Kapoor said, referring to narrow-body aeroplanes built by Airbus Group SE. "Regional routes and SAARC, essentially," he said, referring to member countries of the South Asian Association for Regional Cooperation. "LCCs thus far have not been able to really make the business model work on long-haul international routes. And that is the segment that we are very keen on, along with medium- and short-haul international," said Vistara's Kapoor. Vistara, is considering developing a new brand for its plans to reach thin-density airports. The airline may use smaller aircraft to connect regional airports with those in metro cities, which is similar to the business model followed by airlines in the United States. "In order to avoid the confusion, the product differentiation has to be done. For example, we may give regional aircraft the name, Vistara Express. So people may know the difference and what to expect of each of these brands," Sanjiv Kapoor, the Chief Strategy and Commercial Officer at Vistara, was quoted as saying by DNA. "So far, we are not in talks with anyone on this. At present it's just an idea," Kapoor added. Vistara may either purchase or lease smaller aircraft, which have a 70-odd seating capacity, to implement the plan. The smaller aircraft would be used to connect passengers from regional destinations to metro cities and then, they could be flown to other destinations, including international airports. At Vistara, we have consistently worked towards getting you to your destination on or before time as the #1 on-time airline in India since our inception. We're now happy to take that philosophy a step ahead with #VistaraFlyEarly, a new option that allows customers reaching the airport early to fly early if there is an earlier flight available within 4 hours of the originally booked flight. #VistaraFlyEarly is available only at the airport on a standby basis (that is, if there is space available on the earlier flight, and will be confirmed one hour prior to departure) at a nominal fee of INR 1500 and with no change fee or fare difference payable. This option is available for all classes of travel, for travel in the same class of travel. Further good news: The INR 1500 fee is waived for Vistara’s Flexi Fare customers. So, fly the new feeling with #VistaraFlyEarly and get more time for work or leisure at your destination! On the eve of Independence Day, Vistara, which claims to be India’s fastest-growing full service carrier, on Monday announced special benefits for active and retired Armed Forces personnel and their family members who travel together on Vistara. The airline also said that it will grow to 13 Airbus A320 aircraft and it will fly 500 flights a week to 18 destinations by the end of 2016. Meanwhile, the special discounted fare for armed forces is up to 15 per cent off the lowest available economy class fares, and is available for active and retired armed forces personnel and up to three members of his/her family traveling with him/he on the same PNR. They will also be eligible for 25 kg check-in baggage allowance each on their travel. The discounted fare is on offer for economy class, and will be extended to the premium economy and business class. Within a short span of 19 months, Vistara has expanded its network rapidly from its hub in New Delhi, presently serving 17 destinations across the country. The airline presently has 11 aircraft. Having achieved the milestone of flying over two million customers, meanwhile, Vistara said that it continues to grow. Vistara on Thursday informed travel agents that it will not operate flights on some sectors for a month, on specific dates. These include some flights on sectors like Mumbai-Kochi-Mumbai, Mumbai-Goa-Mumbai, Delhi-Varanasi-Delhi and Delhi-Kochi-Delhi, the airline said in a note to travel agents on Tuesday. “The... flights have been cancelled from 16 August to September (2016),” said the note, which also mentioned the dates of cancelled flights. A Vistara spokeswoman said cancellations were due to engineering checks of aircraft that the airline is conducting in the lean period so as to minimally impact passengers. The airline said the passengers are being informed and alternatives being provided to them. Vistara is planning to rejig its loyalty programme to woo more corporate travellers. People aware of the airline's plans said it is introducing a new level of benefits on its loyalty programme called 'Club Vistara', making earning and burning of miles easier, and considering an invitation-only card for the 'who's who' of India Inc. The new loyalty programme is likely to be launched in September. Vistara, which currently has the silver and gold cards on its loyalty programme, will also add a platinum card with more benefits, including increased baggage allowance and no rescheduling fees, one of the persons cited earlier said, requesting not to be named. Also, while currently a passenger can get upgrades only on the basis of points accrued through miles, under 'Club Vistara' upgrades can also be done on the basis of number of flights taken. Vistara is also considering an 'invitation-only' card which will be given for free to the so-called 'who's who' of the country, the same person said. "That will give the user facilities such as 'meet and assist' from airport staff, more upgrades, etc." he said. Vistara, the full-service airline owned by the Tata group and Singapore Airlines Ltd, is conducting an international operations safety audit and exploring tie-ups with foreign airlines as it prepares to fly abroad, two senior company executives said. The airline, which was launched in January 2015, has hired an auditor to secure the International Air Transport Association (IATA)’s IOSA certification, which would let it finalize commercial agreements with international airlines, chief executive officer Phee Teik Yeoh said. IOSA stands for IATA Operational Safety Audit, a global industry standard. “To start up overseas operations—we are working towards it,” Yeoh said, confirming the airline has appointed an IATA-approved auditor. He, however, did not provide further details about the firm’s international plans. “As part of a long-term plan, we are looking at whether it makes sense for us to have small aircraft; it may not be,” Yeoh said, adding that there was no decision yet on advancing any existing aircraft deliveries. He also said no decision has been taken on international fleet requirements, such as wide-body planes. The fleet plan has to be first approved by the Vistara board. An official at an aircraft manufacturer, who declined to be identified, said Vistara has taken and continues to take presentations for both wide-body planes used for long-haul flights and smaller ones for shorter flights. Aircraft is expected to swap at Guwahati with the aircraft doing Delhi-Guwahati. Vistara has added a new A320 to the fleet today, as VT-TTM. Vistara, India’s fastest growing full service carrier, launched the all-new Club Vistara (CV) frequent flyer program today, with inputs from its frequent flyers and those of other airlines forming the basis for the revamp. With this, Club Vistara becomes the fastest rewarding frequent flyer program in the aviation industry* in India. It is also the most generous and least restrictive of all. The Club Vistara frequent flyer program not only provides its members enhanced privileges but also offers the fastest accrual of points, redemption, and faster elite tier upgrades. CV members can accumulate CV Points when flying with Vistara, engaging with co-brand and airline partners, and also by participating in various promotional activities. In addition to the existing CV Gold and CV Silver membership tiers, the airline has introduced a Platinum membership as its highest tier, and has also introduced a two-track scheme for elite tier qualification, which can now be through points accrued or flights flown, whichever is quicker. Club Vistara Silver, Gold, and Platinum level members receive a host of benefits like additional baggage allowance, priority check-in and baggage handling, priority boarding, complimentary upgrade vouchers and lounge access, depending on their tier status. Talking about the revamp of the program, Sanjiv Kapoor, Chief Strategy and Commercial Officer, Vistara, said, “When we set out to redesign Club Vistara, we started by asking frequent flyers of Vistara and other airlines what they would want to see in their ideal program. We asked them what they valued most, and also what were their key pain points across different loyalty programs. We then designed the program to reflect what we heard. Not only is it now the fastest rewarding loyalty program*, it is also the most generous. Importantly, Elite level benefits can be enjoyed by customers regardless of class of travel or fare paid. It is truly a program by frequent flyers, for frequent flyers.”. There is a special treat for all existing Club Vistara members too. Club Vistara’s new tier qualification criteria will be applied retrospectively to its existing member accounts, which will result in automatic tier level upgrades for many members. The airline is also offering all existing CV members an exclusive limited period 50% discount for redeeming Award flights and upgrades in all classes to thank them for their loyalty. •Fastest Earn: The CV Points-earn structure has been revised to award at least 8 CV Points per 100 INR spent. An array of promotions and offers multiply CV Points earn opportunities. •Fastest Redemption: With multiple ways to earn, CV members can now reach the redemption levels faster. Free flights can now be redeemed for just 2000 CV Points, and one-class upgrades are available for just 500 CV Points. •Faster Elite Tier Qualification: With the new tier evaluation criteria, journey to the top is now shorter based on tier points or number of flights flown. The tier points required to reach CV Platinum is only 35,000 or 40 flights flown in 12 months. Vistara today said it plans to operate 530 flights per week by year end with the induction of its 13th aircraft, which is expected to be delivered to the airline next month. The city-based airline, Vistara, in which Tata Sons and Singapore Airlines own 51 per cent and 49 per cent stake, respectively, currently operates 430 weekly flights to 17 destinations with a fleet of 12 Airbus A320 planes. "We have inducted the 12th aircraft in the fleet last week, and the 13th aircraft will be delivered to us in the third week of October. With this, we will be operating 530 flight per week by this year end," Vistara Chief Strategy Commercial Officer Sanjiv Kapoor said. As part of its fleet expansion plans, Vistara will induct 20 aircraft -- 13 Airbus A230 and another seven Airbus A320 (neo) by June 2018. Launched in January 2015, the airline currently holds 2.4 per cent market share. He said the airlines will also introduce its flight services to Port Blair from September 30, which would be the airlines 18th destination. On the on-going low fare war, triggered by the national carrier Air India, which has dropped its last-minute ticket prices, airline chief executive officer Phee Teik Yeoh said that "such pricing is not sustainable." "We have tailored our pricing more with the market demand. we are not talking about what you call the reckless pricing. Vistara, the Tata-Singapore Airlines' joint venture, will introduce more flights from Calcutta and Hyderabad as these airports are willing to provide more slots than the other major metros. "We are selectively adding flights in various parts of the country. Calcutta and Hyderabad have offered more slots than Mumbai or Bangalore and, therefore, it is easier to add new routes from these cities faster," said Sanjiv Kapoor, chief strategy and commercial officer, Vistara. The full service airline is also gearing up for its international foray from the second half of 2018 when it will have the mandatory fleet of 20 aircraft, necessary to fly abroad. "We will be going international very soon," Phee Teik Yeoh, CEO of Vistara, said, adding that by June 2018 the airline will have a fleet of 20 aircraft - 13 A320s and 7 A320Neos. In a span of 20 months, Vistara has expanded its domestic network to 17 destinations with 430 weekly flights. The 18th destination, Port Blair (New Delhi-Calcutta-Port Blair), will be added later this week (30 September). Over the next four weeks, Vistara's fleet will grow to 13 aircraft which will fly 515 flights weekly. Vistara has added a new A320 to the fleet today, as VT-TTN. Tata-SIA joint venture airline Vistara has completed the induction of Airbus A320 ceo planes in its fleet, with the arrival of the 13th and the last such aircraft from Toulouse in France this week. The airline will now induct fuel-efficient A320 neo (new engine option), which are scheduled to be delivered from the first quarter of the next fiscal. Vistara plans to use the 13th A320 plane in launching its operations from Kolkata to Bangalore, Guwahati and Port Blair. The city-headquartered airline had in 2014 announced leasing of 20 Airbus A320 planes - 13 A320 ceo (current engine option) and seven A320 neo (new engine option) - from Singaporean leasing firm, BOC Aviation. "We have taken delivery of the 13th and final A320 ceo plane. The aircraft will be based in Kolkata for carrying out services on Kolkata-Bangalore, Bangalore-Guwahati (via Kolkata) and Kolkata-Port Blair routes," a Vistara spokesperson told PTI. These new services would commence operations from the 18th of this month, the spokesperson added. "The deliveries of the remaining seven of the 20 planes, which are A320 neo planes, will commence from the first quarter of the next fiscal," he said. All these seven planes are to be inducted in the fleet by June 2018. "Our fleet is growing bigger and stronger. We welcome the 13th member of Vistara family," Vistara had earlier tweeted after taking delivery of the aircraft from the Toulouse manufacturing facility of the European plane maker, Airbus. The Directorate General of Civil Aviation (DGCA) has certified Vistara, the JV carrier of Tata Group and Singapore Airlines, for category III B (CAT III-B) landing in dense fog, just ahead of the coming winter. The certification will enable Vistara to safely operate under low visibility conditions due to fog or any other poor weather conditions, which is anticipated in north east and northern parts of India in coming days. The under two-year-old airline now joins the ranks of 'old' Indian carriers that have Cat IIIB-enabled fleet. "Permitting its CAT IIIB compliant fleet and crew to safely take-off and touch-down with a runway visibility range (RVR) of as low as 75 meters," a statement by Vistara said. Vistara CEO Phee Teik Yeoh said: "Although a bad weather condition is beyond our control, we always endeavor to minimize the inconvenience faced by our customers during a flight delay or diversion arising from inclement weather.... I am proud of my team's relentless efforts in the past months to secure the regulatory approval for Cat 3B well in time before the fog season sets in. This certification will allow us to provide a seamless flying experience to our valued customers." Vistara's current fleet of 13 Airbus A320s come with the integrated CAT IIIB auto land system. Vistara has launched sales for direct DEL-IXZ vv flights on 18Dec16 and 01Jan17. - This would officially be the longest scheduled flight in India beating G8's BOM-IXZ by about 193 Km. - The block time on the inbound leg would be almost 4 hours. Is premium economy becoming a trouble for Vistara? The board of Tata Sons, the largest stakeholder in the airline, certainly feels so and have even asked the airline management to discontinue the service if it proves to be unviable. In a board meeting held in June where Vistara CEO Phee Teik presented the company’s performance to the directors of Tata Sons, the airline was asked to review the viability of a three class configuration something unique to Vistara in Indian skies. According to the minutes of meeting submitted by ousted chairman Cyrus Mistry to the Company Law Tribunal and reviewed by Business Standard, Nitin Nohria, a non-executive director in the Tata Sons board said that the airline should put down a timeline of one year after which it should be discontinued if it remains unviable. Nohria said that Vistara remains the only airline which continues to believe there is business from three segments. 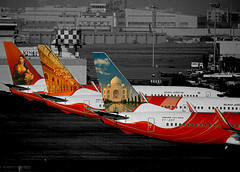 “A triple class airline in a two-hour leg doesn’t exist anywhere in the world, leave alone India. For such a class to be successful there should be heavy differentiation which can bleed an airline in a market like India,” says a senior executive of a low cost airline. Vistara however sees no reason to discontinue the strategy. “It is a pioneering concept introduced by Vistara in the domestic market, demand for our premium economy has been steadily increasing since the time we introduced it. Our customers recognize and appreciate the unique value proposition offered to them in the exclusive PEY cabin. We don’t have any plans to discontinue the three-class configuration,” a Vistara spokesperson said. Very interesting, Sir, very interesting. IXL: which of the fleet can do the IXL ops: how many, and which registrations? LDH has an airfield with difficult operations (power line?). The demand is also very low, and yields, rock bottom. I remember how 9I regularly cancelled flights, and bussed passengers (if any,) via ATQ. ATQ should not be a bad move for UK. Thanks once again, for quite a information-and-analysis packed article! Thank you for the two pieces of information! VNS is primary the limited operating window as I see it. I do not know how many planes the airline got modified for IXL or if all of its planes can go. MUMBAI: Vistara plans to start international flights in the second half of 2018, its chief operating officer said Wednesday. Vistara will first start short haul flights and then go long haul with widebodied planes, Sanjiv Kapoor said at the CAPA India Aviation Summit 2017. The airline now has 13 Airbus A320 planes and will get to 20 by July 2018. From April onwards, Vistara will start getting the A320 Neo (new engine options) plane, the upgraded version of the most popular airliner in the world. In an interview in June last year, the airline's CEO Phee Teik Yeoh had said the airline would consider direct flights to the US and UK. 1. This will Vistara's first scheduled red-eye flight. 2. The only other flight on the route is operated by IndiGo. Under some promotional sale, the flight is selling at INR 2,599 on some days! Two days ago, the ground safety team from Vistara airline visited Surat airport for safety survey. The company is likely to submit a proposal to the DGCA and seek flying slot at Surat airport as it intends to start flight services from April. The airline will be connecting Surat with Delhi, Chennai, Hyderabad and Bengaluru. As a result of this - UK will reduce Delhi-Hyderabad to 12 weekly. Vistara has entered into a code-share agreement with SilkAir, the airline said on Tuesday. SilkAir is Singapore Airlines’ regional subsidiary which flies into India. The code share on Indian domestic flights operated by Vistara will be effective from today. Vistara is working on a plan to go international by next year. The code-share will help it feed its parent airline as well as its own flights. Under the agreement, Singapore Airlines will add its “SQ” designator code to Vistara-operated flights beyond Mumbai and New Delhi to 10 destinations while SilkAir will add its “MI” designator code to Vistara-operated flights beyond Bengaluru and Kolkata to six destinations within India. Vistara, the TATA-Singapore Airlines Joint Venture, announced its first code share agreement today having signed the codeshare agreement with equity partner Singapore airlines (SIA) & its regional subsidiary Silk Air. The code share is in place with immediate effect. SilkAir will add its ‘MI’ designator code to Vistara-operated flights beyond Bengaluru and Kolkata to six destinations within India, which are Guwahati, Hyderabad, Kochi, Mumbai, New Delhi and Port Blair. The codeshare agreement is Vistara’s first with another airline group, as well as SIA’s and SilkAir’s first with an India-based domestic carrier. Both the airlines had an interline agreement in place since December 2014 and was the first interline agreement for Vistara. Thanks for the update, Sir. I got to see it first hand today itself (15 Mar, 2017) at CCU: a Vistara flight code-shared with an SQ number. I caught a fleeting glimpse of the board, this raised my eyebrows a bit, as I rushed towards my gate. Once again, a lovely article! Nice introduction, and build-up: as to why a third FSC need remains in India. I have been trying to follow the Vistara network rejig, but am a bit confused. CCU isn't a nice place to fight 6E at, or even #2 AI, for that matter. However, the lucrative NE routes beckon. The RDG is also a factor here. I guess you seem to imply that Y+ is perhaps here to stay with Vistara, but given that AI and 9W are perhaps not even planning to go ahead with it, do you think that this may be a temporary boom (more so, with the Y-to-Y+ differentiation issues, and eating into their own J segment), and that the deep pockets at both Tata Sons and SIA helping out? Food: Vistara continues to disappoint a bit, in spite of having perhaps the best catering option nearly in-house, Taj-SATS. The IFE silence is deafening. An about-turn, much like the seat reconfig which did not print a pretty picture of Mr. GMT, then. Aircraft type: nice analysis. Do you foresee a combination of these types? It looks a bit difficult, though. More so, for a growing airline, this may not be the best option. SIA has not yet tested the Dream)liner except in their Scoot fleet. AI's strong MRO and Dream)liner base may well turn the choice towards the B789. Do they see obvious benefits of the increased capacity of the B789 vis-a-vis the B788? Distance-wise, LHR/SIN/HKG are perfect for the B788 as well. I look forward to your views on the above. Thanks once again, for a nice and thought-provoking article! Singapore Airlines Group this week commenced codeshare partnership with Vistara, covering various domestic India service. From 26MAR17, planned codeshare routes as follow. When did this start ?? how are the reviews? is it SQish? are they trying to maintain their standards? Did a couple of HYD-DEL trips recently. One in Prem Economy and one in Business. I would rate them "Amatuerish" at best. Forget SQish...at the moment they dont even hold a light to 9W. Vistara is likely to place order for around 100 aircraft, including 50 wide-body planes by the end of the current quarter, according to an industry report. The Centre for Asia Pacific (CAPA), the Sydney-based aviation think-tank, in its report titled "Global Fleet and Financing Review 2017," also said that the airline is likely to opt for Boeing 777X for long haul operations. "Vistara is expected to be the next carrier to place a major order, of up to 100 aircraft before June, 2017, comprised of 50 narrow-bodies and 50 wide-bodies," CAPA said in its report today. This assumes significance in the backdrop of Vistara mulling launching international operations from mid 2018. The airline is expected to stick with Airbus for single-aisle equipment and is likely to opt for the 777X for long haul operations, the report said. When contacted, a Vistara spokesperson said that the airline does not comment on market speculations. "We don't comment on market speculations," the spokesperson said in response to a PTI query on the issue.